While many pet colognes from big box stores can be overwhelming or artificial smelling, Show season offers Spring Rain Pet Cologne with a mellow, fresh aroma that does not offend one's nose. Featuring Hawaiian plumeria, it offers an appealing sensual fragrance for those who don't like the typical overpowering floral smell. 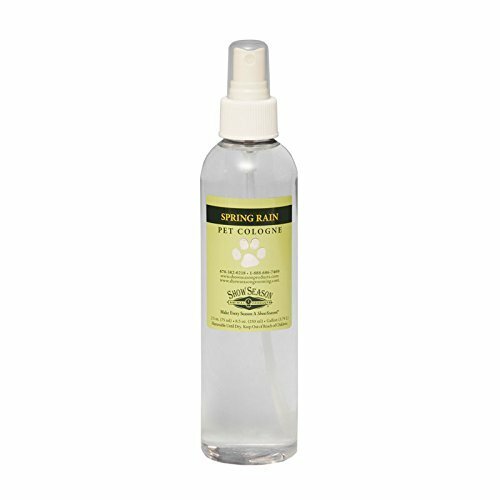 This pet cologne safe for use on dogs, cats, puppies and kittens. If you have any questions about this product by Spring Rain Pet Cologne, contact us by completing and submitting the form below. If you are looking for a specif part number, please include it with your message.